Operating systems and their updates are in danger of privacy breaches. That is the case with Windows 10, Microsoft's newest toy. It has been in the market for three years now, and while it represents a tangible improvement over the Windows 7, Windows Vista, and Windows 8 versions, there are a few issues you need to keep in mind. For example, with the excuse of "improving service and offering a customized experience", Microsoft's Windows 10 and some of its third-party associates make a habit of collecting users' data and monitor everything they do or visit online. And while some people don't mind seeing direct and personalized advertising messages, others don't like it when their own OS tracks every move they make. Windows 10 is a Microsoft-made operating system and the newer version of the giant tech company. It provides continuous feature updates to improve user experience, as well as security patches, and long-term support milestones. Despite the notorious privacy problems associated with Microsoft and other third-party companies, people have been enamored with the Windows 10 operating system ever since it hit the market. The appearance of Windows 10 signaled the end of the unreliable and insecure Internet Explorer web browser. Instead, the brand-new Microsoft Edge came to replace it with excellent reviews. In general, the Windows 10 is the first step towards a transition from a mouse-oriented approach to a touchscreen one. The operating system can be installed and used in several platforms, such as PCs, smartphones, tablets, Surface Hub, Xbox One, and others. Cortana serves as your personal assistant, but at what cost? In an era where voice-controlled devices proliferate, Microsoft made sure not to stay behind in the area. For the Windows 10 operating system, they developed a personal assistant to help users find documents, files, execute commands, and do several other things. The name of the virtual assistant is Cortana, and it gathers information about what you do and searches online and offline. It saves your preferences, location, connection details, and more, to provide a "personalized experience." That concept is always controversial and extremely divisive. The best and most efficient way to keep your interactions private is hiring the services of a VPN provider. Virtual Private Networks, shortened to VPN, are online encryption apps or resources found on custom, private companies and also public, free ones. They encrypt and reroute every bit of data that the customer shares online: browsing history, login time, location (IP address) and more. The encryption and rerouting are made for security and privacy reasons: if the person manages to hide its IP number, which functions as its online identity, it will be significantly harder for any third parties and external agent to track. Hackers, crypto miners, malware developers, copyright enforcers, governmental surveillance agencies, and online advertising companies, among others, won't inflict the same damage in the customer's system if its data is protected and shielded by the VPN "tunnel". Windows 10 users are the perfect examples of why using a VPN puts them in advantage compared to running the operating system in their PCs with no encryption or protection. To successfully avoid any privacy breaches or violations, including Microsoft or your Internet Service Provider (ISP) keeping logs of your data and selling them around the web, just take the content out of their sight. Setting up a VPN using a Windows 10 PC is very straightforward. Numerous brands and companies provide the service. Users often prioritize paid, custom apps over free VPN because the latter have their own security and privacy issues. Among the best options, you can choose SurfShark is one of the speediest and most reliable, protecting your Windows 10 and your PC from all external agents with robust encryption. You can download VPN client here. How to set up a VPN using a Windows 10 PC? Assess the market and select a reliable VPN brand with extra privacy and security features, not to mention robust encryption and a no logging policy. Select your preferred plan. Most VPNs have monthly and yearly subscriptions, while others also have free versions and six-month terms. Register for the VPN service, providing a payment method and your personal information. Download and install the VPN client in your PC. Make sure it is compatible with Windows 10. Launch the VPN app in your PC. Sign in with the credentials you configured in the fifth step. Connect to a virtual server from any location. Done! You have successfully installed a VPN in your Windows 10 PC. How to add and connect to a VPN on Windows 10? Right click on the Start button of your Windows 10 PC. Access the Network and Internet section. Select the Add a VPN connection option. Select the menu below the VPN provider. Write your VPN connection name. Click on the Server name or address field. Now, you will write the server's address, available on your VPN account. Access the drop-down menu located below the VPN type. Select your preferred VPN protocol. Select the menu located under Type of sign in info. Select the VPN you just configured, which will be available on the VPN list. Write your login credentials (username and passphrase) to connect. Done! 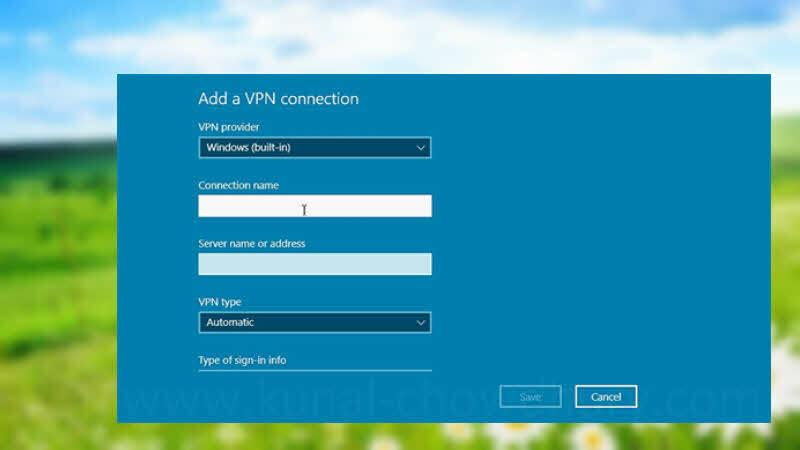 You have added and connected a VPN in your Windows 10 PC. In conclusion, the Windows 10 operating system is a definite upgrade over other Microsoft products. However, it is more privacy-invasive, so you need to be careful with what you share online or get a VPN to reroute and encrypt your content and protect it from any potentially dangerous agent. If you have come this far, it means that you liked what you are reading (How to set up and run a VPN in a Windows 10 PC? ).